521 Beacon is located on the south side of Beacon, between Massachusetts Avenue and Charlesgate East, with 519 Beacon to the east and 523 Beacon to the west. 521 Beacon is one of ten contiguous houses (511-529 Beacon) designed by architect Samuel D. Kelley and built in 1887 for Chadwick & Stillings (N. Henry Chadwick and Oscar L. Stillings), a hat block and flange company that became a significant house building firm in the 1880s and 1890s. 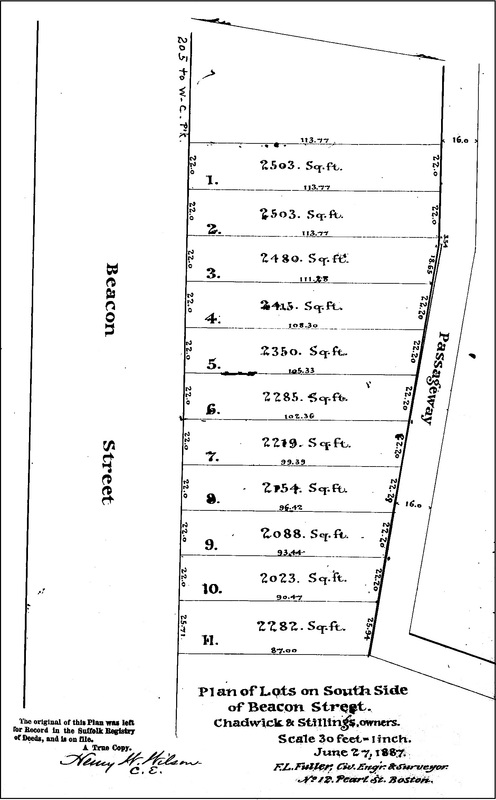 They are shown as the owners and builders on the original permit applications, all dated March 14, 1887, and on the final building inspection report for 521 Beacon, dated November 14, 1887. The next year, Chadwick & Stillings built one more house, also designed by Samuel Kelley, at 531 Beacon. 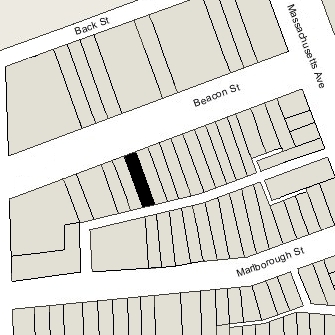 Click here for an index to the deeds for 521 Beacon, and click here for further information on the land west of Massachusetts Avenue between the south side of Beacon and the north side of Commonwealth. On January 7, 1888, 521 Beacon was purchased from N. Henry Chadwick and Oscar Stillings by Catherine Davenport (Hayward) Savage, the wife of Samuel Hay Savage, a shipping merchant and real estate investor. They previously had lived 431 Beacon. Samuel Savage died in October of 1901. Catherine Savage continued to live at 521 Beacon until her death in October of 1923. 521 Beacon was not listed in the 1924 Blue Book. On January 23, 1924, 521 Beacon was purchased from Caroline Savage’s estate by Martha G. (Gately) Cogan, the widow of Thomas Francis Cogan. She lived at 47 Prentiss. On January 31, 1924, 521 Beacon was acquired from Martha Cogan by Mary Virginia (McCowean) Tillson Tillson, the wife of Benjamin R. Tillson (and the widow of his son, Ralph Arnold Tillson). They lived at 50 Gainsborough. On January 20, 1926, 521 Beacon was acquired from Mary Tillson by real estate dealer Cecil R. Seymour, and on July 15, 1926, it was acquired from him by Dr. Frank H. Sargent, a physician. He and his wife, Nellie M. (Winslow) Sargent, lived in Pittsfield, New Hampshire. 521 Beacon was not listed in the 1926 Blue Book. By 1927, 521 Beacon had become the home and medical office of Dr. Bertha Lulu (Cameron) Guild, the former wife of Chester Guild, IV, a physician. She previously had lived and maintained her office at 78 Huntington. On July 8, 1927, Bertha Cameron Guild acquired 521 Beacon from Frank Sargent, and on July 11, 1927, it was acquired from her by Miss Carolyn Gertrude Huestis. By 1928, Dr. Guild had moved to 8 Batavia. On October 19, 1927, 521 Beacon was acquired from Carolyn Huestis by Frank J. Hurson, a watchman in factory, and his wife, Helen M. (Hennessey) Hurson, who operated it as a lodging house. The Hursons continued to live at 521 Beacon during the 1928-1928 winter season, but moved thereafter to 513 Beacon. On February 21, 1930, the Taunton Savings Bank foreclosed on a mortgage it held on 521 Beacon and took possession of the property. It continued to operate 521 Beacon as a lodging house. On March 9, 1932, 521 Beacon was acquired from the Taunton Savings Bank by Pierce J. Duggan. On September 1, 1932, the bank foreclosed on its mortgage to Pierce Duggan and took back possession of the property. The house was shown as vacant in the 1932-1933 City Directories, and was not included in the 1932-1933 Lists of Residents. In about 1934, 521 Beacon became the Kenmore Dormitory operated by Gertrude R. (Loewy) Hydeman, widow of Ernest N. Hydeman. She previously had operated the dormitory, under the same name, at 365 Marlborough. She continued to live at 521 Beacon in 1936, but moved thereafter and was living in Florida at the time of her death in 1940. By 1937, the Kenmore Dormitory was operated by Miss Rose Ruvin, a former social worker. Living with her were her sisters, Eda Ruvin, a nurse, and Pauline Ruvin, a secretary in a dispensary. They all previously had lived at 382 Riverway. They had come to America in 1906-1907 with their mother, Gertrude (Gittel) (Garshfield/Hershschild) Orzefsky (Orzewsky), widow of Reuben Orzewsky; they began using the surname Ruvin in about 1913. They continued to live at 521 Beacon until about 1938, when they and the Kenmore Dormitory moved to 325 Commonwealth. By 1939, 521 Beacon was the home of Miss Elizabeth Rochford, who operated it as a lodging house, called Oxford House. She previously had lived in Brookline, having immigrated to the United States from Montreal in 1937. On July 21, 1942, she purchased the house from the Taunton Savings Bank. In 1950, Elizabeth Rochford married Patrick MacNeil, a widower. He was a plumber. After their marriage they lived at 521 Beacon and continued to operate it as a lodging house. On April 1, 1957, 521 Beacon was purchased from Elizabeth MacNeil by Louis DiGiovanni, trustee of the Aloy Realty Trust, and on March 13, 1958, it was acquired from him by David H. Glass and Alvin L. Hearst, doing business as Milbo Realty Company. It continued to be operated as a lodging house. On November 6, 1961, 521 Beacon was acquired from David Glass and Alvin Hearst by real estate dealer Hugh Richardson Farrington, as trustee of the 521 Beacon Street Trust. In September of 1960, he and his wife, Clara Marcellina (Cormier) Farrington, as trustees of the Hugh J. Trust, had acquired 517 and 519 Beacon. 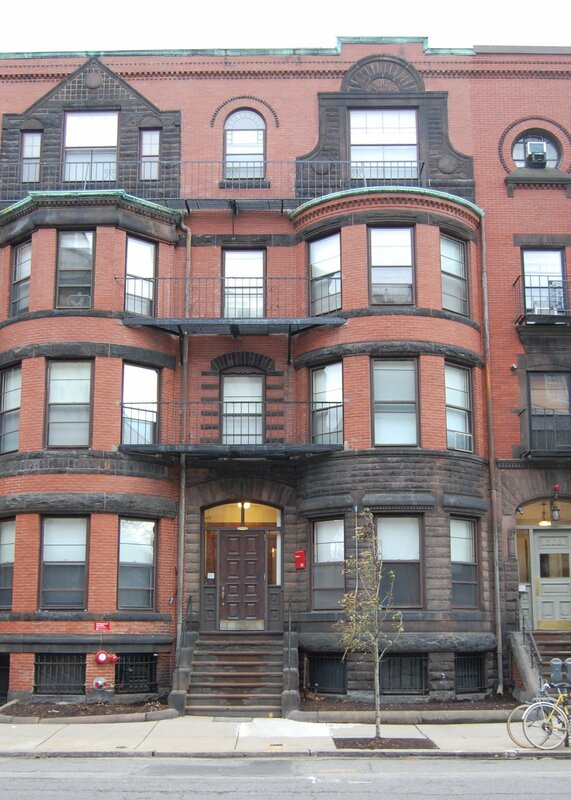 Hugh Farrington operated 517-519-521 Beacon as a dormitory for Boston University students. On May 24, 1968, 517-519-521 Beacon were purchased from the Farringtons by Boston University. Boston University continued to operate 517-519-521 Beacon as dormitories for BU students. The legal use of the buildings remained as lodging houses, however, and in October of 1980 the University filed for (and subsequently received) permission to legalize the occupancy of 519 Beacon and 521 Beacon as dormitories, reflecting their current use. In June of 1980, they had filed for (and subsequently received) a similar change in use for 517 Beacon. 521 Beacon continued to be a dormitory in 2018.